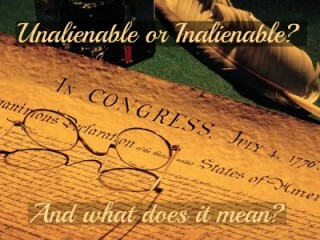 Inalienable or Unalienable: Either Way, What Does It Mean? Home / Blog / Inalienable or Unalienable: Either Way, What Does It Mean? I did a post on the best dads in literature a week after Father’s Day. Now I’m writing about the Declaration of Independence a week after the 4th of July. Something’s wrong with my timing. We hold these truths to be self-evident: that all men are created equal; that they are endowed by their creator with certain unalienable rights; that among these are life, liberty and the pursuit of happiness; that to secure these rights, governments are instituted among men, deriving their just powers from the consent of the governed; that whenever any form of government becomes destructive of these ends, it is the right of the people to alter or abolish it, and to institute a new government, laying its foundation on such principles, and organizing its powers in such form, as to them shall seem most likely to affect their safety and happiness. That is a single, masterful, grammatically correct and logically coherent sentence. I was referring to it in a lesson I was editing today, when it occurred to me that I’ve heard a version that included inalienable rather than unalienable. So I looked it up. What I found was that both forms are acceptable synonyms and that Thomas Jefferson used inalienable in his original, handwritten draft, but that it was later changed to unalienable. No one knows for sure, but it’s possible that John Adams, who supervised the printing, preferred it and considered the more common term. Inalienable is preferred in most modern dictionaries. Subscribe by clicking here. You won’t regret it. While I was doing this research something else occurred to me. I didn’t know what the word meant. I had actually never given it much thought. I had always assumed from context that it meant something like irrevocable or undeniable, but those were words available to the founders, yet they selected unalienable. Unalienable (or inalienable) means: that which cannot be sold or transferred; unable to be given or taken away. I assume it’s connected to the root alien in the sense that it’s something that cannot be moved away from its original location. It cannot be displaced or alienated. After looking up the definition, I asked around. I asked some of my most patriotic friends and they were in the same boat. They had never really thought about that word even though they could recite the whole sentence from memory. It was then I realized I had a blog post on my hands. A week belated, but somehow knowing this lexical tidbit makes me feel like a better American. Thanks for the mini history lesson, Brian! I thought I knew what the word meant, but there’s more to it than I thought.